Warning #1: He is controlling. “If my control and authority seem to be slipping, I have the right to take steps to reestablish the rule of my will, including abuse if necessary. Warning #2: He feels entitled. Entitlement is the abuser’s belief that he has special status and that it provides him with exclusive rights and privileges that do not apply to his partner. Physical caretaking: He expects his partner to do the majority of the house and kid stuff the way he likes it, while he constantly criticizes, complains or insults. Emotional caretaking: He feels entitled that his needs are your responsibility and your needs are your responsibility. Sexual caretaking: He considers it his partner’s duty to keep him sexually satisfied. He may not accept having his sexual advances rejected, yet turn her down whenever he feels like it. Deference: His unstated rule that she is not to question his ideas. Freedom from accountability: He believes he should be permitted to ignore the damage his behavior is causing and he may become retaliatory if anyone tries to get him to look at it. Warning #3: He twists things into their opposites. 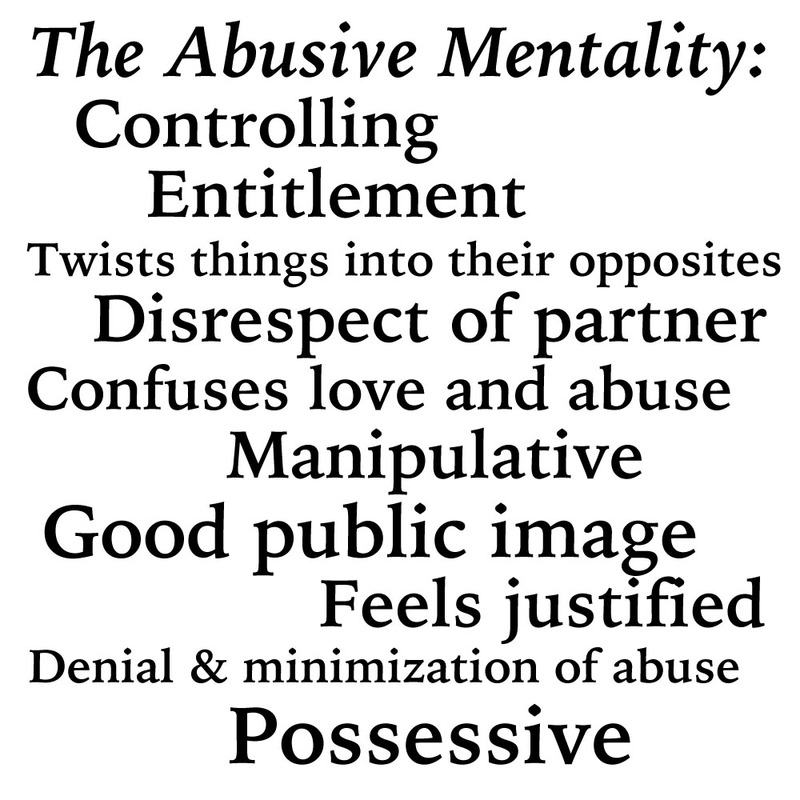 The abuser’s highly entitled perceptual system causes him to mentally reverse aggression and self-defense. The lens of entitlement the abuser holds over his eye stands everything on its head, like a reflection in a spoon. An abuser says, “You’re saying I should lie down and let her walk all over me” because he is told that intimidating his partner is unacceptable no matter how angry he is. He says, “So you’re telling us that my partner can do anything she wants to me, and I’m not allowed to lift a finger to defend myself” because his partner told him that she was sick of his friends trashing the house and that he should clean up his own mess.” When he was told there was no excuse to call her a disgusting name, he says, “Your approach is that whatever she does is okay, because she’s a woman, but because I’m the man, there’s much stricter rules for me” with his double standards. The abusive man has mother reason to exaggerate and ridicule his partner’s statements: He wants to avoid having to think seriously about what she is saying and struggle to digest it. He feels entitled to swat her down like a fly instead. Warning #4: He disrespects his partner and considers himself superior to her. He often has difficulty conceiving of her as a human being. This tendency in abusers is known as objectification or depersonalization. Most abusers verbally attack their partners in degrading, revolting ways. By the use of the most degrading word they can think of, abusers make their partners feel both debased and unsafe. Objectification is a critical reason why an abuser tends to get worse over time. As his conscience adapts to lone level of cruelty–or violence–he builds to the next. By depersonalizing his partner, the abuser protects himself from the natural human emotions of guilt and empathy, so he can sleep at night with a clear conscience. He distances himself so far from her humanity that her feelings no longer count, or simply cease to exist. Abuse and respect are opposites: You do not respect someone whom your abuse, and you do not abuse someone whom you respect. Warning #5: He confuses love and abuse. An abusive man often tries to convince his partner that his mistreatment of her is proof of how deeply he cares, but the reality is that abuse is the opposite of love. The more a man abuses, the more he is demonstrating that he cares only about himself. He may feel a powerful desire to receive your love and care taking, but he only wants to give love when it’s convenient. The desire to have you devote your life to keeping him happy with no outside interference. The desire to have sexual access. The desire to impress others by having you be his partner. The desire to possess and control you. Genuine love means respecting the humanity of the other person, wanting what is best for him or her, and supporting the other person’s self-esteem and independence. Warning #6: He is manipulative. Changing his moods abruptly and frequently, so that you find it difficult to tell who he is or how he feels, keeping you constantly off balance. His feelings toward you are especially changeable. Denying the obvious about what he is doing or feeling. He’ll speak to you with his voice trembling with anger, or he’ll blame a difficulty on you, or he’ll sulk for two hours and then deny it to your face. You know what he did–and so does he–but he refuses to admit it, which can drive you crazy with frustration. Then he may call you crazy for getting so upset by his denial. Convincing you that he wants to do what’s best for you. This way the abuser can make his selfishness look like generosity. Getting you to feel sorry for him, so that you will be reluctant to push forward with your complaints about what he does. Getting you to blame yourself or other people for what he does. Using confusion tactics in arguments, subtly or overtly changing the subject, insisting that you are thinking or feeling things that aren’t, twisting your words, and many other tactics that serve as glue to pour into your brain. You may leave arguments with him feeling like you are losing your mind. Lying or misleading you about his actions, his desires, or his reasons for doing certain things, in order to guide you into doing what he wants you to do. Getting you and the people you care about turned against each other by betraying confidences, being rude to your friends, telling people lies about what you supposedly said about them, charming your friends and telling them bad things about you, and many other divisive tactics. When a woman gets shoved or slapped, she at least knows what her partner did to her. But after manipulative interaction she may have little idea what went wrong; she just knows that she feels terrible, or crazy, and that somehow it seems to be her own fault. Warning #7: He strives to have a good public image. Enraged at home, but calm and smiling outside. Selfish and self-centered with you, but generous and supportive with others. Domineering at home, but willing to negotiate and compromise outside. Highly negative about females while on his own turf, but a vocal supporter of equality when anyone else is listening. Assaultive toward his partner or children, but nonviolent and nonthreatening with everyone else. Entitled at home, but critical of other men who disrespect or assault women. Abusive men are drawn to power and control and part of how they get it is by looking good in public. Warning #8: He feels justified. Abusers externalize responsibility for their actions, believing that their partners make them behave in abusive ways. They defend their abusive actions. Abusive men are masters of excuse making. In this respect they are like substance abusers, who believe that everyone and everything except them is responsible for their actions. Most abusers do have a conscience about their behavior outside the family. They may be willing to be answerable for their actions at work, or at the club or on the street. At home, however, their sense of entitlement takes over. The abusive man commonly believes he can blame his partner for anything that goes wrong, not just his abusiveness. Did he just suffer a disappointment? She caused it. Is he embarrassed by a mistake he made? She should have prevented it. Is one of the children in a difficult period? She’s a bad mother. Everything is someone else’s fault and that “someone else” is usually her. Warning #9: Abusers deny and minimize their abuse. Most abusive men admit to some abusive behavior–although they don’t see it as abusive, of course–but they acknowledge only a small portion of what they have actually done. A woman can feel that she is losing her mind–or developing psychiatric symptoms–if the obvious realities of her life, including abuse, are denied repeatedly by her partner. The certainty and authority in his voice, with his eyes twisted up to show how baffled he is, leave her questioning herself. “Did that really happen? Maybe it didn’t. Maybe I do over react to innocent things.” The more serious the incidents he denies, the more her grip on reality can start to slip. And if outsiders start to notice her instability, the abuser can use their observations to persuade them that her revelations of abuse by him are fantasies. Warning #10: Abusers are possessive. EPTworks™ can help those in abusive relationships by helping them regain their God-given power. When a human being is denied the right to have needs or to express their needs in a relationship; physical and emotional sickness is the result. Most people who seek help with EPTworks™ come because of physical or emotional sickness. Understanding and knowing the patterns of abuse: Oppression and victimization will help you to realize when that pattern is part of the picture so that you can be a better counsel to your client. Understanding these patterns will also help you with more specific forgiveness statements. In Progressive Concepts, we discuss in detail how to identify and help those who are caught in an abusive relationship. Click here to learn more and register!